During the Christmas break I began to focus my attention on the Canadian market, searching out stocks that had not yet participated in the bull market or that had further room to run. I started to call these stocks my “Venture” ventures but that is not really accurate; I’ve actually only invested in a couple of companies that trade on the Venture exchange. But they do tend to be small and micro and even nano cap companies, so many of them are Venture in spirit if not name. My thesis was based upon a few pillars. First, the Canadian markets severely underperformed the US markets in 2013 and given the tie between the trade of the two countries I didn’t think this disconnect could continue forever. Second, The Canadian markets were dragged down by a rout in commodity stocks, particularly gold, and I wondered how much of the general downdraft had resulted in non-commodity businesses being dragged down unfairly. Third, the Canadian dollar had fallen 10% and I had to think that this made any kind of export based business much more attractive. The fall of the Canadian dollar also provided me with another reason to return to my home-country market. I have done really well in the past year owning stocks in American dollars. Its been a 10% gain across the board, even if a individual stock did nothing. But this force can work two ways and I am wary of a 5% correction to the upside that causes my portfolio to take a hit. Honestly, the number of Canadian stocks that I have researched and boughtover the last month and a half has overwhelmed my ability to write about them. I’ve made some pretty significant changes to my portfolios; I bought 11 Canadian stocks (and also one US stock) in the last month and a half. It seems like a lot of stocks, and it is, but keep in mind that a number of them are Venture ventures, small company’s with small market capitalizations and illiquid trading, and in these cases I have kept my positions to less than 1.5% and in most cases less than 1%. Of the names above I have already talked about Avcorp, Macro, Sherritt and ADF Group. I have write-ups in the works on Empire, Nordion and Terra Energy. I plan to write up the others as time permits but here are some brief thoughts on four of them. I got the idea for Northstar Healthcare from a fellow who goes by the moniker Wiggling on Investor Village. He mentioned the company here. I took a look and got directed to this Seeking Alpha post, which does a very good job of outlining the history of the company, the business model, and the seeds of the turnaround that seem to be in place. Northstar owns a number of Ambulatory Surgical Centers in Texas. The story here is a stock that has suffered because its facilities have been operating at a very low utilization rate, much lower than the industry average. 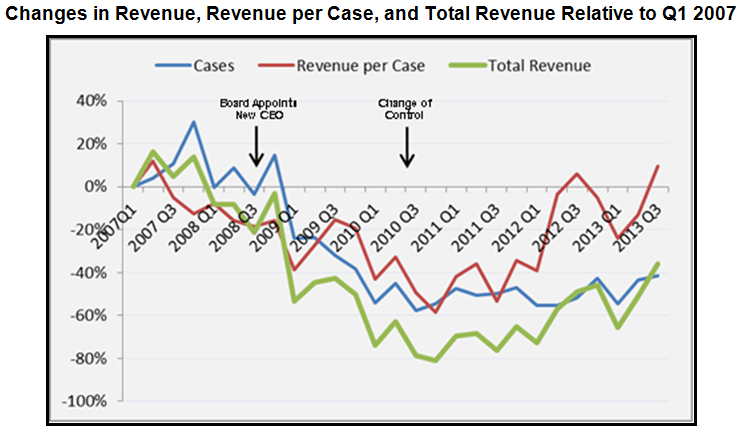 But the revenue per case has held up and actually improved over the last number of quarters. If the company can turn around its utilization rate and make efficient use of their fixed costs, I think that the earnings could increase substantially. Below is a nice graphical illustration of the historical utilization rate and revenue per case that I stole from the Seeking Alpha article. What really sold me on the stock was that the company recently announced December revenues of $5 million. With October and November revenues at $4 million and $3.8 million respectively, total revenues for the fourth quarter should approach $13 million. This is a big step up from the $7.6 million in revenue that they recorded in the third quarter, and they only had $17.6 million in revenue over the entire first nine months. While the stock isn’t particularly cheap based on its recent history, it does appear that a turnaround is in the early stages and the fourth quarter number is evidence of that. If the fourth quarter is as strong as it looks and if there is some evidence that the momentum is sustainable, I expect the stock to do well from here. This one is not a Venture venture so I actually have a decent sized position in it. The stock is not, however, in my on-line portfolio because I did not initiate any position in the account I use to track and report on in this blog. The idea for Boralex came from Stephen Takacsy, who appeared on this BNN Market Call segment a couple of weeks ago. I thought it might be worth explaining how I decided to investigate the company in the first place. It had little to do with my initial thoughts on Boralex. A utility is typically not going to excite me. What piqued my interest was the guest himself; I watch a lot of BNN segments and I found the comments from Takacsy, on Boralex and others (I also took the idea of TVA Group from him) very impressive. Its worth noting that since I bought, Bill Harris, another BNN Market Call regular, has recommended the stock. At the enterprise level, because of the project financing that the company has used to fund much of this growth, the company may only be moderately cheaper than it is now. But the cash flow available to share holders should be significant. The company has smartly taken advantage of a strong debt market and financed these projects, which are for fairly low risk long-term contracted power, at advantageous rates. What has held the stock back so far is that Boralex is so focused on their growth that they do not pay a dividend. A utility without a dividend excludes a large part of their investing population. I suspect that in a couple of years they should be able to pay a substantial one and that this will change the yield seeking investors perspective on the name. Integrated Asset Management is a little asset management firm ($1.7 billion in assets under management) that is trading at just above cash. The company has a market capitalization of $21 million and cash of around $19 million which has been buoyed by the recent sale of their retail asset management wing BluMont Capital for about $10 million (see the press release for the sale here). Of note, one of BluMont’s fund managers is Veronika Hirsch, of BNN fame. The company has generated a small profit from continuing operations and about $1.5 million of EBITDA. They had pretty similar numbers in 2012. While that isn’t very exciting, all of the revenue they generated in 2013 was from management fees, and in 2012 they only had about $1.3 million in net performance fees. Because their real estate and debt investments are lumpy, they only get performance fees when gains on the investments are actually realized. In 2014 there should be more significant performance fees; I estimated around $3 million based on the schedules of their MD&A. Given that the company is basically trading for free, this seems like a pretty decent spec. They also have been paying a 5 cent dividend annually. I actually made this position a bit bigger than the other “Venture ventures” that I have taken because I think the risk is lower (relative to the others of course, not in any absolute sense) and the upside more significant once the market catches on. I also added Swift Energy on the US side. Swift is a domestic oil company with some very good acreage in the Eagleford. What really has me interested in the company though is that its cheap (around 4x EV/EBITDA) and with the recent run-up in natural gas prices I am optimistic that they can divest some of the gassy assets that they have on the block at a decent price; freeing up cash to pay down debt and invest in the Eagleford. I also sold much of the position I took in New Residential. I took some off near the highs, in the $6.90 range, with the rest around $6.60 -$6.70 immediately after the stock went ex-dividend. Of the stocks I sold out of my portfolio, I’m not particularly inclined to discuss any of them in detail. Here is a short synopsis of my thinking on each name. Equal was a long slog that eventually netted me about 20% profits. With propane and natural gas prices having spiked in the last few weeks, I may regret having sold the stock too soon. Timmins was a short slog that, in typical gold stock fashion, saw me down nearly 30% at one point only to sell out a few weeks later for a 30% gain (for once I actually caught the top on a stock as I hit the sell button on Timmins a mere day before the company announced a private placement). Novus was sold as the stock approached its takeover price and resulted in about a 50% gain. I would consider Newcastle to be removed on a temporary basis only, as I plan to add the position back as soon as the New Media spinoff is complete (I am looking forward to adding New Media as well once the company has taken its proper beat-down from large institutional funds that are now stuck with a spin-off they can’t hold). And Pinecrest, well Pincecrest was a disaster. I seem to have an implosion about every 6 months (with Niko being the previous one). I escaped on the morning of the company’s latest disappointing news release at 25 cents. When I got into the stock I stated that the risk was that the waterflood doesn’t work and the tone and language of the last news release suggests that this might be the case. Honestly I’m not sure; it really could be just another hiccup that they can turn around, but I have not done well sticking it out when a situation continues to deteriorate. I took my shot and it didn’t turn out so I am out so I will look for glory somewhere else. 38% loss in hand. did you drop newcastle for now to avoid tax complications? No it was more because I think the stock will go down as the New Media spin occurs. I think its anticipated that New Media will be sold post-spin so there will be some doing the exact same thing as me and selling before the spin. I tried to beat the crowd to that. I actually didn’t know about tax implications. Can you elaborate? Shortly following the Distribution Date, Newcastle will announce Record Holders tax basis in the Distributed Shares, which will be equal to the fair market value of the Distributed Shares. The fair market value of the Distributed Shares, or a portion thereof, may be taxable. However, the taxable portion of the Distributed Shares, if any, cannot be determined until early 2015 because it is based on Newcastles total distributions in 2014 and Newcastles accumulated and current earnings and profits (E&P) at the end of 2014. For U.S. federal income tax purposes, all of Newcastles distributions (whether in the form of cash or stock) in any year are treated as taxable dividends to the extent of its E&P for such year. Assuming that Newcastle has positive E&P at the end of 2014 and that total distributions in 2014 are less than or equal to E&P at the end of 2014, then the entire fair market value of each distribution, including the Distributed Shares, will be taxable. Assuming that Newcastle has positive E&P at the end of 2014 and that total distributions in 2014 are greater than E&P at the end of 2014, then a portion of each distribution, equal to the ratio of (i) E&P to (ii) the aggregate fair market value of 2013 distributions, will be taxable. I’m also interested in New Media here, though how attractive it is will depend on the price once it starts trading. on your LNG thesis – have you taken a look at HNL? For IAM, how are you getting your total cash figures? – Blumont sale closed in December. From Note 3 Discontinued operations: As consideration, the Corporation received cash of approximately $6,600,000 on closing and the Corporation is entitled to receive future consideration based on a specific percentage of any net performance fees (as defined) realized as at December 31, 2013 and in 2014 and 2015. So that’s a little less than $20 million. Admittedly I am including cash receivables from Blumont and cash in the form of investments. He’s getting out of it for the same reason I’m getting into it. I have been waiting for a correction in the stock for a few months.